It is the 4th of July and the RV park is having a pot luck and entertainment later in the day. Having already toured the town of Flagstaff and seen the Lowell Observatory, we decided to spend the holiday exploring the countryside. 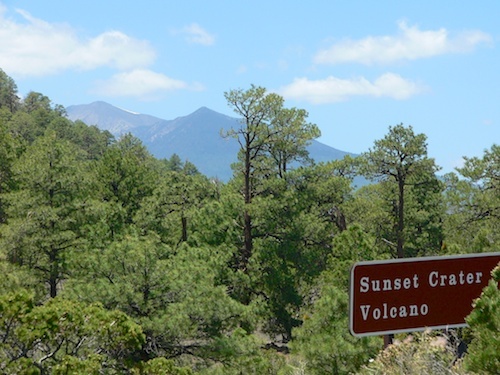 First stop, Sunset Crater National Monument, about 15 miles north of Flagstaff. This crater is in the eastern part of the San Francisco volcanic field, and is fairly young, having erupted only 800 or so years ago. 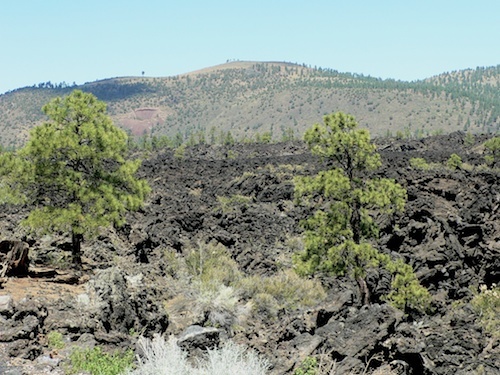 The lava flows and cinder fields are still there, and covered a pretty wide 810 square miles. 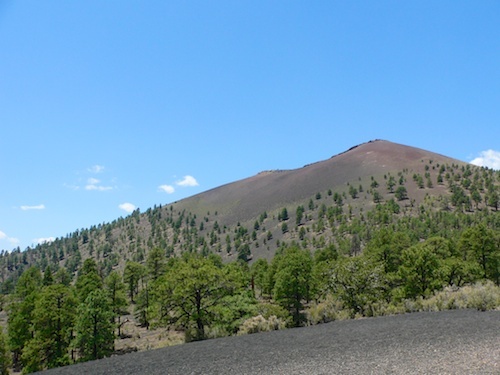 The crater got its name from the rusty brown patches of rock spatter around the top of the cone. In the right sunlight the rocks glow bright red. This area forms the western border of the Painted Desert and there were great vistas of this colorful expanse that we had just explored a few days before. After getting our fill of lava flows we drove another 10 miles north to Wapatki National Monument. When the volcano we had just visited erupted, sometime in the 1100’s, it altered the land, making it uninhabitable and forcing the Sinaguas, the native people who lived and farmed the area, further into the desert. The Wapatki Monument contains the still standing remnants of this ancient culture. 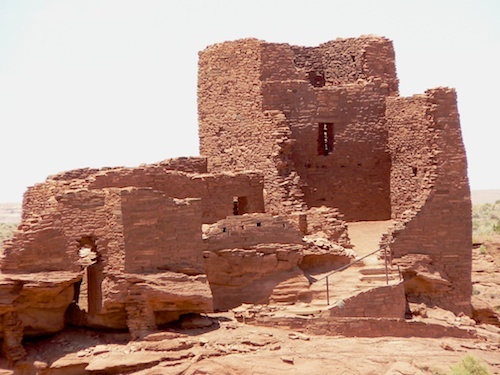 The largest is the Wukoki Pueblo, three stories high and visible for miles. 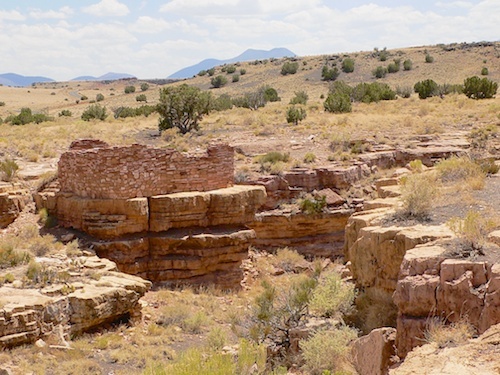 We followed the trail that wanders in and around the five different pueblos that still remain and enjoyed this peek into the life of people long gone. 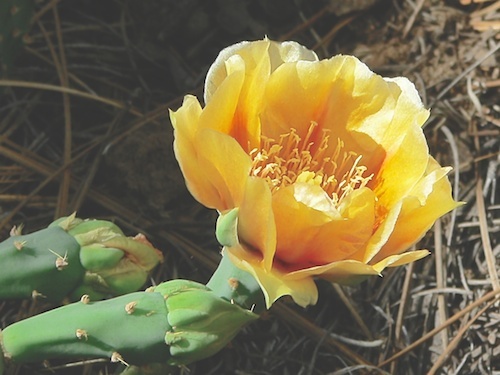 It is believed that the Hopi Indians are the descendants of these original settlers. We arrived back at the RV park in time for Hubby to whip up his famous baked beans for the 4th of July pot luck party. Many of our fellow campers winter in the warmer areas of Arizona, then head to the cooler climate around Flagstaff for the summer. There were musicians to serenade us, and we had a lot of laughs and a good time sampling the many dishes and sharing travel stories with our neighbors.